Wednesday was Wyatt’s first day back at school. We had tacos the night before, so as I was cleaning up the dinner leftovers I packed them into a Laptop Lunches box. 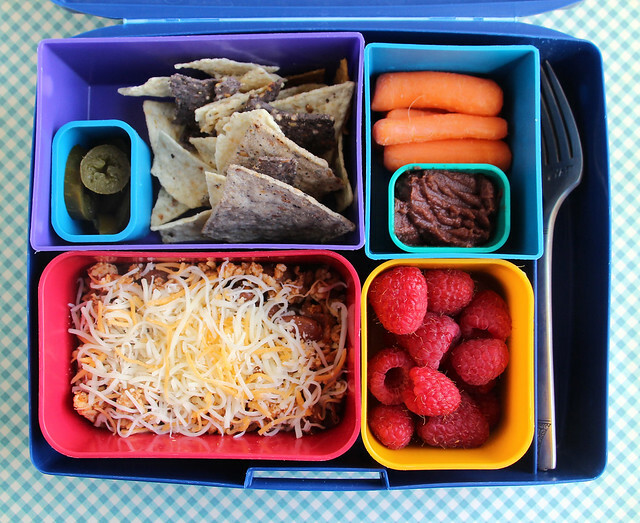 He had pickled “no heat” jalapenos, tortilla chips, carrots, black bean dip, raspberries and a mixture of ground turkey and pinto beans with a little grated cheese sprinkled on top. The jalapenos were a fortuitous mistake. I’d meant to buy regular jalapenos because my husband looooooves them on tacos and nachos and I accidentally bought the “no heat” jar. I didn’t even know they made such a thing! We decided to give them a go and even persuaded the kids to try them and they liked them! Augie was sick, so he stayed home from school. I still had jet lag, so I was up bright and early on Thursday morning, leaving me plenty of time to mess around with lunches. 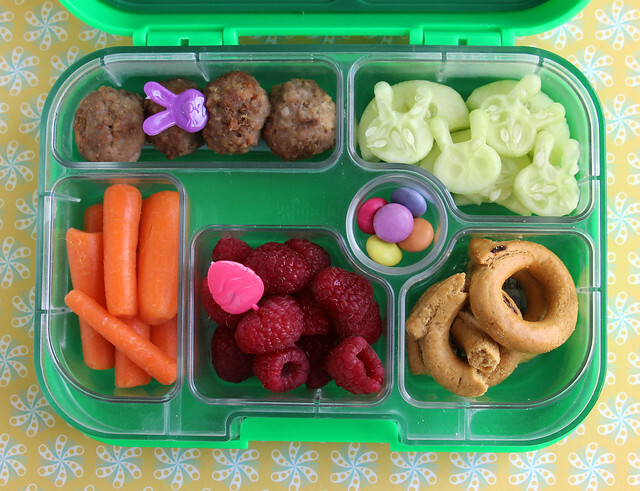 I wanted to pack Wyatt an Easter bento, but he flat out refused to allow me to put any type of bunny in his lunch box, let alone a pink or purple one. 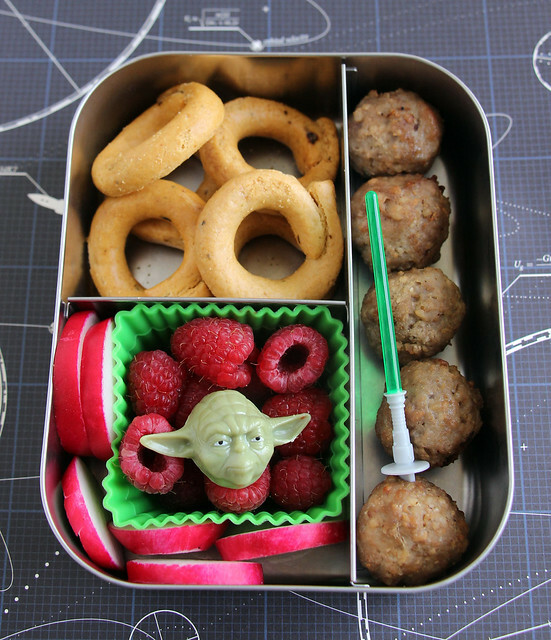 I managed to convince him to let me do a Star Wars lunch as long as I didn’t make it too fancy so I went all Yoda on his bento. He had some taralli crackers that we brought back from Italy, raspberries with a Yoda ring, radish slices and meatballs with a green light saber pick. This was all packed in the LunchBots Trio. This is what was left in his lunch box when I unpacked it after school. He ate the taralli and the radishes for his snack. 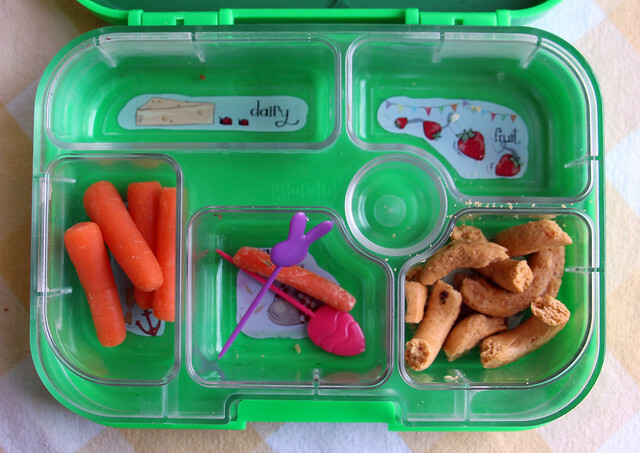 Augie was back to normal and had no qualms about bunnies, so I packed him this Easter-y lunch in the Yumbox. I started by poking an Easter bunny pick into a few of his meatballs, then I cut a few of his cucumber slices into bunny shapes. I tucked the scraps underneath along with a few regular cucumber slices. He also had carrots (for the bunnies to eat), raspberries with an Easter egg pick, a few Smarties candies (also from Italy) and some taralli. ….And this is what came home. I don’t know why the kids shunned the taralli in their lunches, because they’ve been gobbling them up for snack-time at home. I can never predict their lunch consumption, nor do I try…. I was up early again on Friday, so I had a little extra time to play with Wyatt’s lunch. I started by drawing a silly face on half a banana with a food-safe marker , then I made his sandwich (salami and cheese) look like a monster with a couple of eye picks and a jagged cut on the top slice of bread. 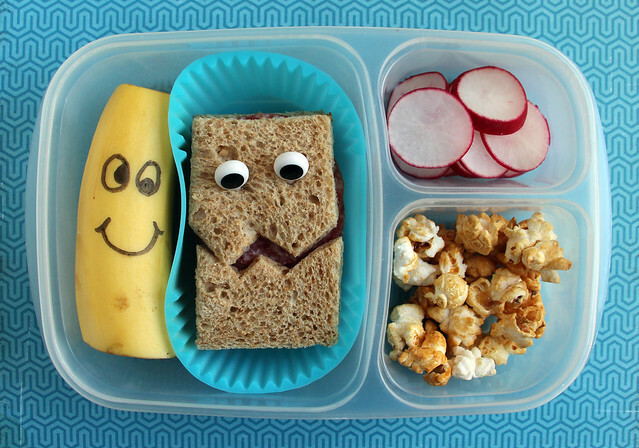 I filled the side dish containers of the EasyLunchboxes container with sliced radishes and a little bit of caramel corn for a Friday treat. 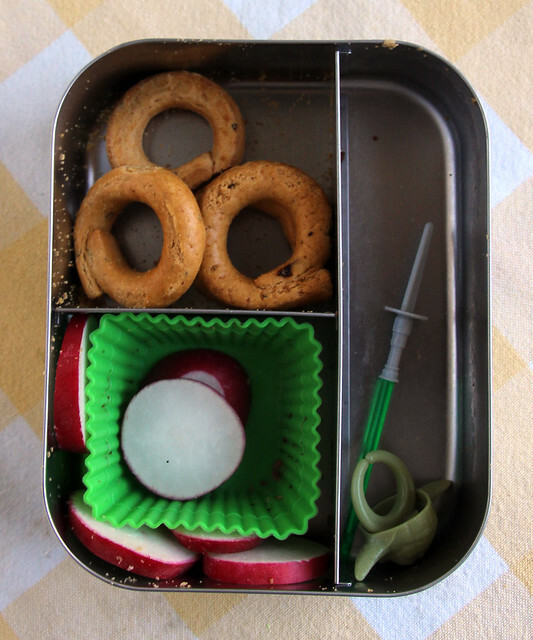 Augie asked for a bunny lunch and the PlanetBox, and I was happy to hook him up with both. 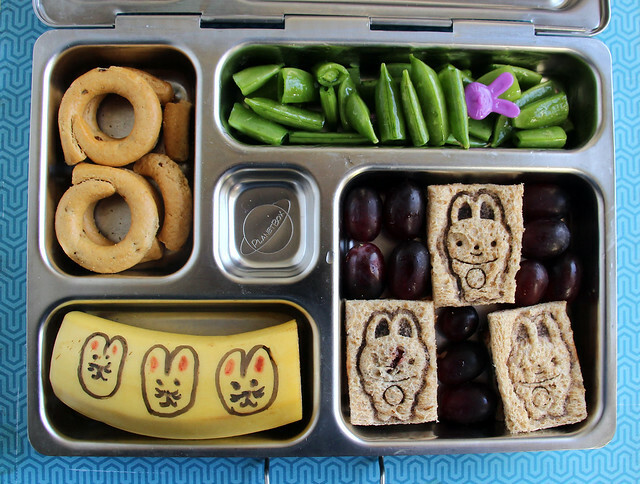 He had taralli, lemony sugar snap peas, a half banana with mediocre bunnies drawn on it (I used food-safe markers again), grapes and bunny peanut butter and jelly sandwiches. The peas were a repeat of a dish I’d served at dinner the night before. I chopped up snap peas then tossed them with a simple vinaigrette of Meyer lemon juice and olive oil. Normally, Augie is strongly opposed to vinaigrettes, but I convinced him to try it because it didn’t have any vinegar in it and he liked it! And imagine my surprise when he requested the same dish in his lunch in the morning! The bunny sandwiches were made using a new-to-me technique and I had mixed success with them. The bunny cutter/stamp set I was using was very small and I didn’t really feel like fussing with the small pieces of bread, so I decided to just use rectangles to save myself some grief. I tried just stamping the bunnies, but they were hard to see, so I colored all over the stamp with a food marker and then stamped it. If you look at the photo above, you can see that I got a little better with each sandwich. The only thing I thought looked really bad, was the crack in the bunny’s face on the lower left sandwich. The jelly behind it makes it look like a bloody gash across his face! Poor bunny!